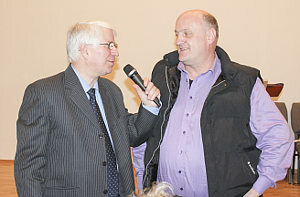 NEW NECK: Erik Lundegaard Madsen from Billund in Denmark had both his neck healed and his life changed after receiving prayer at the Miracle Saturday meeting on 28 April 2012. The whiplash injury had plagued him for ten years - but today his neck is completely fine. Ten years ago, Erik Lundsgaard Madsen from Denmark was whiplashed after a car accident. On 28 April, 2012 he went to the Miracle Saturday meeting in Vennesla and was healed. Now finally a long nightmare is over. Erik Lundsgaard Madsen lives in Billund in Denmark where the amusement park Legoland is. In recent years, life has been very difficult. It all started ten years ago, when Madsen and a friend were in a car accident. Madsen was the front seat passenger and was thrown sideways into the side window. -I was 14 days in the hospital with a concussion. Eventually I got a severe pain in the neck that would not go away. It turned out to be whiplash. For long periods I was on sick leave. Much of that time was spent just lying in bed. I had a headache and eventually I got migraine headaches. Every day I took more painkillers, he said. Madsen was sent to have a number of examinations performed, which included having his head and neck scanned. He was frequently at a physiotherapist, but the neck injury did not get better. He spent a lot of money on various treatments without it helping. -I was actually working as a mechanic, but due to the injury I needed to change my profession. For a while I tried being a caretaker, but had I to change my job again. This continued throughout the years. I have spent tens of thousands of kroners to no avail. Madsen says that all the sickness was a major burden for the family, which ended with divorce. -It was a ten year long nightmare! he says firmly. Erik Lundsgaard Madsen had over the years read and heard about Svein-Magne Pedersens ministry in Vennesla. On Saturday April 28 was a Miracle Saturday meeting, and Madsen made the trip to Norway, something he would not regret. -I did not feel anything in particular when Pedersen prayed, just that there was a peaceful atmosphere present. It was at first the following day during the boat ride back to Denmark, that I noticed that my neck was significantly better. After a few days the pain was all gone, says Madsen, who now has a new everyday life. He is now back in his working life again, and he works at the motor and vehicle branch. - It is amazing what God has done, and everything happened so easily. Over the years I have received a lot of prayer, but there had been a lot of yelling and screaming. People have said I have had too little faith, or they have accused me of living in sin, since I was not healed. I knew what Jesus had done for me on the cross and did not give up. Today I thank God that my life has changed, Erik says happily. Madsens story was also quickly known among people, and not long ago the Danish Christian magazine Udfordringen («The challenge») knocked on his door and wanted to write about his testimony. -Here I could tell what God had done. The key is to not give up, but to trust in God, he concludes.